A few weeks ago, Sugarpill released their much anticipated ElektroCute Neon Pigments collection. They were first seen at IMATS a few years ago and people have been waiting patiently ever since. Well, wait no more! They are finally here, and you sure cannot miss them. They are brighter than the sun and more sparkly than crushed diamonds. They are true neon pigments that are definitely statement making and are a perfect addition to Sugarpill line. These pigments are unique from others out there; they are truly neon, matte, yet are loaded with glitter that gives them a really cool effect. It's like the 80's in a jar! I wanted to put these pigments to work and create a look that would really make these bright colors stand out. 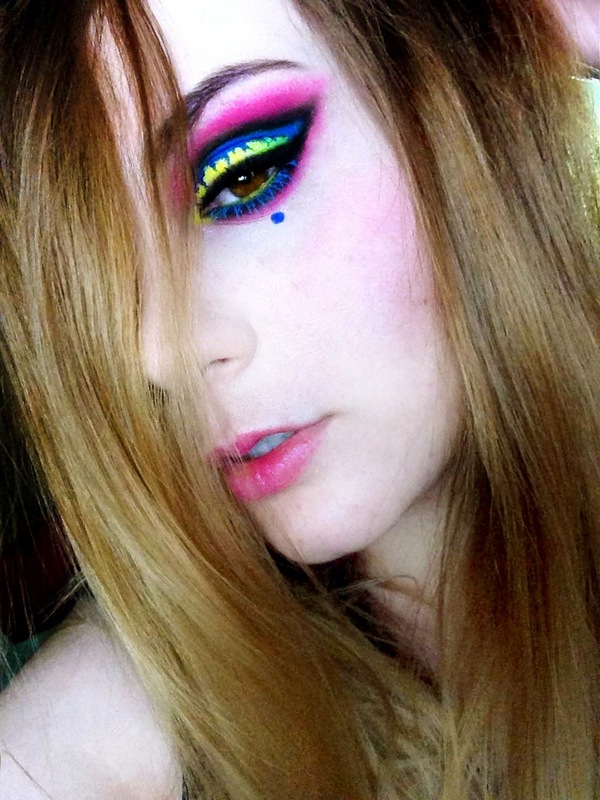 The colors are already loud and wild, so I went ahead and put together a crazy look to show off these babies. Kinda looks like an alien-esque, toxic, neon ooze, right? Sorry for the crappy iPhone photo! I've been having issues with my normal camera. The Sugarpill ElekroCutes come packaged in a super cute clear plastic box with neon writing and is adorned with a lightning bolt. Love Buzz is an intense hot pink that is loaded with pink and blue sparkles. This is the most pigmented of the bunch, but it did stain my skin a little bit. Super Charged is a bright peachy orange with gold and orange sparkles. This was the least pigmented and hardest to work with. Hi-Viz is a seriously neon, highlighter yellow that is oh so gorgeous. Probably my favorite of the collection. It is packed with yellow glitter. Sparkage is a lovely neon grass green and has yellow and green sparkles in it. So pretty! Hellatronic is a bright, yet deep royal blue that is packed with blue and purple sparkles. It looks very similar to Sugarpill's Royal Sugar, however this one is a lot more glittery and not as smooth. When I got this package in the mail, there was a HUGE mess. One of the colors had opened up and was all over the place. That didn't shy me away from the prettiness that was to come though! Upon opening them, I was amazed at how brightly neon and sparkly these are. They are no joke, and only Sugarpill can get away with something like this. They are loud and obnoxious, and I absolutely love that about these pigments. One thing that I do need to mention is that since these are neon pigments, they contain certain ingredients that are not approved by the FDA for use on the eyes in the United States. However, it is approved in Europe and Canada. So use these at your own risk. I did not have a problem with them really, except that the pink shade, Love Buzz, stained my skin a little. These are intensely pigmented, however they are a little tricky to work with compared to Sugarpill's traditional pigments. They really need some TLC. Neon makeup is notorious for being powdery and a bit chalky, so a good primer or a white sticky base like NYX's Jumbo Pencil in Milk is a MUST for these to perform well. The glitter also plays a role in these being a little difficult to work with. I highly suggest patting these on with a flat brush and try not to over-blend, or you will lose the intensity. These have a lot of fallout, but that is expected with the nature of these pigments. By no means are these a bad product, they just need a little extra work for them to look good. The main issue I have with these is that the glitter does not stay on for very long. After about an hour or so, I lost almost all the glitter on my eyes. Honestly though, I prefer the look of these with a little less glitter, so all is good in the hood. Overall, these are awesome for the type of makeup that they are and they are a great addition to Sugarpill family. If you are a color and glitter junkie, then these are right up your alley. If you are interested in purchasing these, they are available over at www.sugarpillshop.com for $16 USD each. Each eyeshadow weight is 5 grams. As always, Sugarpill is a cruelty-free company and some of their stuff is vegan. Win! I really hope you guys liked the look and found the review helpful! I know the look is a little out of the box, but I felt like being a little more creative this time. Let me know what you think! This look is amazinggg! It just popped up on my instagram and I had to come online straight away and check it out! I love it! The lime colour is incredible! The look you did with it is amazing. 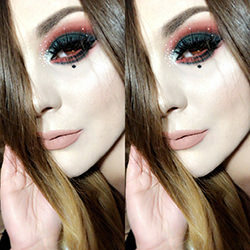 I really love your makeup in pretty much all of your posts but I notice you haven't done YouTube tutorials for most of them and I'd love to see how they were done so I have guidance when I am doing them on my own. This is such a cool look. Wish you had made a YT video I would love to see how you create that bleeding effect between the blue and yellow.